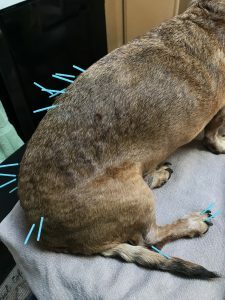 Abstract: This case report evaluates the use of medical acupuncture in the treatment of chronic Intervertebral Disc Disease (IVDD) and hyporexia in an 11 year old Dachshund. Five acupuncture sessions were performed over the course of seven weeks. Following these acupuncture treatments owners report that the patient seems much more relaxed, his pain is controlled without the use of medications, he is less neurologic, and his appetite had improved. History and Presentation: Siggy is an 11 year old, neutered male Dachshund with a history of Intervertebral Disc Disease (IVDD) and heart disease. Records indicate that Siggy first started to show signs of IVDD in April of 2010. When owners woke up one morning the patient was hunched, painful, and lethargic. There was no inciting injury or trauma prior to this presentation.Radiographs performed at that time showed narrowing between T10-11 and T11-12 disc spaces. The back pain seemed to resolve with pain management and rest. There were no further reports until October of 2011 when Siggy was once again listless, anorexic, and weak on his hind legs. Radiographs showed a calcified disc between T11 and T12. An MRI was discussed but not pursued. Surgery was also discussed but the owners declined. The patient once again seemed to improve with pain management and rest. The most recent episode of back pain occurred in November of 2017 and records indicate that the patient was unable to use his hind limbs at the time of presentation. Superficial pain was intact, but conscious proprioception was absent on each hind limb. The patient was still urinating and defecating normally. Acupuncture was discussed and referral was offered, but owners declined both at the time. The patient was sent home with pain management and instructions for strict cage rest. I first met Siggy for a recheck exam about a month after his initial visit. At that time his pain seemed to be controlled, but he was still exhibiting weakness and neurologic deficits in his hind legs. The owner was very concerned about the kyphosis along the thoracolumbar spine and his difficulty with ambulation. Pain management was continued (Rimadyl and Methocarbamol). In January of 2018 the patient returned for another recheck exam. His owner reported minimal improvement in mobility and the patient was now hyporexic. His owners had tried many different types of foods but the patient was refusing to eat anything but treats. The owner did not believe that the current pain medications were helping and requested something different. A three week trial of Gabapentin and Prednisone was started. These seemed to help tremendously with both pain and appetite, and they did not need to be continued long term. 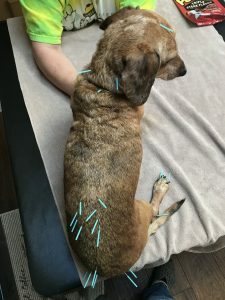 When Siggy first presented for acupuncture in June of 2018, the owner reported that his overall pain level was minimal, yet his mobility was still limited. The patient’s kyphosis was more pronounced, and he seemed to move slowly and stiffly. He would periodically scuff the toes of his left hind foot when walking, and he avoided stairs. The owner also reported that Siggy was restless at night, and seemed to have trouble getting comfortable. The patient’s appetite had improved, but it was overall still decreased. As a side note, Siggy was first diagnosed with a heart murmur in December of 2013, and was started on Enalapril and Pimobendan. An echocardiogram has not ever been performed to further classify the murmur. The patient does not cough and has not ever had any episodes of congestive heart failure. Physical Examination and Clinical Assessments: On his initial physical exam Siggy was noted to be bright, alert, and responsive. He was mildly overweight with good muscle tone overall. He was quite kyphotic along his thoracolumbar spine and a mild pain response (muscle spasm and flinch) was elicited with palpation along this region. Active range of motion in the neck was normal as the patient would readily follow a treat in all directions. Myofascial palpation did elicit some tightness in the muscles over the dorsal cervical region and moderate muscle tightness could be palpated in his triceps and hamstrings bilaterally. The patient would actually pull away with palpation of the hamstrings. Siggy had delayed conscious proprioception on the hind limbs. When his hind paws were placed on their dorsal surface he would not correct them readily. The response on the left was noted to be prolonged when compared to the right, but both were delayed. Superficial pain was present. Patellar reflexes were noted to be normal to increased. A crossed extensor reflex was elicited bilaterally. There were no neurologic abnormalities appreciated in the front limbs. With ambulation Siggy did scuff the toes of his left hind foot. Tail carriage was low. Neurologic exam findings were consistent with an upper motor neuron lesion. As previously mentioned the patient also has a Grade III-IV/VI systolic heart murmur. There were no arrhythmias appreciated. The lungs were clear of any crackles or wheezes. Siggy’s most recent radiographs (taken on 8/25/2018) showed subjective narrowing of the T9-T10 and T10-T11 disc spaces. A calcified disc was noted between T10-T11. There were mild arthritic changes (boney protrusions) on the ventral aspect of L5. No bridging spondylosis was appreciated. There were no vertebral fractures or discospondylitis indications. Definitive (or Putative) Diagnosis (or Diagnoses): Given breed (Dachshund), chronic history, and radiographic findings, IVDD is the most likely cause of the patient’s clinical signs. Radiographs have not revealed discospondylitis, and given that signs of pain do resolve and some function returns with anti-inflammatories, FCE is unlikely. Medical Decision Making: For Siggy, the main goals were to decrease pain, improve neurologic function of his hind legs, and increase quality of life overall. This was a fairly chronic case, so we elected to start with once a week treatments. The plan was to address the patient’s deficits centrally, peripherally and via autonomic pathways. As we are primarily treating IVDD, central pathways were the main focus. Our goal was an acupuncture session every 1 to 2 weeks. Treatments are still ongoing, but for the purpose of this case study, four treatments were performed with the longest span between appointments at 11 days. Please note, although both were considered as part of a multimodal approach, for the duration of this study I did not have access to an electrostimulator or a laser unit. These modalities will be incorporated in future sessions. The above points were selected to try to address relevant central, peripheral, local, and autonomic pathways. When possible, bilateral points were needled. The majority of the points selected were central given the history of IVDD. Central points included GV20, GV14, Bladder points and GV4. Bladder points along the thoracolumbar spine also served as local points given the palpated trigger points in this area. Peripherally, points like Bafeng, the hip triad, and SI11 and 12 were selected. On my physical exam there was tightness in the shoulders and down the triceps muscles. This is likely because of the altered weight distribution from the hips to the shoulders. With the neurologic deficits in the hind limbs the patient relies on his front limbs more to ambulate. For autonomic neuromodulation, points like ST36, Bai Hui, GV4, GV14, and GV20 were selected. To address a history of a decreased appetite, points such as BL20-21, and ST36 were needled. Outcomes: After four treatments, there was noted to be significant, qualitative improvement in overall comfort, mobility, and even appetite. Owners report that the patient is much more relaxed and calm after his treatments. He is not as restless at night and has been sleeping more soundly. Neurologic deficits are still present (limited conscious proprioception on the hind limbs), but they seem to be slightly improved. Scuffing of the left hind foot with ambulation is less evident. Siggy’s owners state that the patient has also elected to use a small set of stairs to come inside the house instead of an available ramp on more than one occasion. Stairs were something that had been avoided prior to the start of acupuncture therapy. The patient’s appetite has even improved as he is much more willing to eat his dry kibble. The addition of acupuncture was the only change for the patient during the time frame of this case study (June to July). The patient was not receiving any medications for IVDD at the start of treatment, and no medications needed to be added during treatment. There was also no change to daily routine or activity level. Therefore, one can conclude that the outcomes described above can likely be attributed to medical acupuncture. There were no adverse events during the treatment period. Discussion: A prospective study performed in 2017 by Silva, Nuno E.O.F, et al. offers support for the use of medical acupuncture in chronic cases like Siggy’s. Silva states, “Although the assessment and management of acute pain in animals has advanced considerably, chronic pain is still underestimated and, therefore, under treated.” This study reviewed the effect of acupuncture alone or in conjunction with analgesics, on pain and quality of life in canine patients with either neurologic or musculoskeletal disease. The study relied on the owner’s assessment of their pet as they would fill out surveys before each visit evaluating overall attitude, behavior, and quality of life. The authors found that there was indeed a statistically significant improvement in pain and quality of life following medical acupuncture treatments. It is interesting to note that canines with musculoskeletal diseases had greater improvement than those with neurologic disorders. The goals outlined in this study (pain reduction and improved quality of life), mirrored what I hoped to achieve with Siggy. While Siggy’s case was initially primarily neurologic, I can now see how that condition also affects musculoskeletal elements as it becomes more chronic. With this chronicity, I did not know what sort of outcome to expect, so both the owners and I are pleased with the degree of improvement we are seeing in such a short period of time. While Siggy may need analgesics in the future, it is extremely rewarding to see the improvement in his daily life with acupuncture alone. The owners plan on continuing with regular treatments. Siggy could benefit tremendously from electroacupuncture and laser therapy, and I intend to incorporate them as we continue therapy. IVDD is a common condition in general practice and I am excited to be able to offer medical acupuncture as part of a multimodal approach in both acute and chronic cases. Silva, Nuno E.O.F, et al. “Effect of acupuncture on pain and quality of life in canine neurological and musculoskeletal diseases.” The Canadian Veterinary Journal 2017 Sep; 58(9): 941-951.